Kearns (/kɜːrnz/ kurnz) is a Metro Township and census-designated place (CDP) in Salt Lake County, Utah, United States. Named after Utah's U.S. Senator Thomas Kearns, it had a population of 35,731 at the 2010 Census. This was a 6.2 percent increase over the 2000 figure of 33,659. 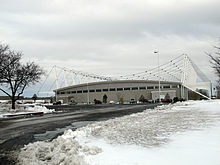 Kearns is home to the Utah Olympic Oval, an indoor speed skating oval built for the 2002 Winter Olympics. Actor and entertainer Palmer Scott was raised in Kearns from 1956 to 1980. Kearns came into existence 1 May 1942 as a World War II United States Army Air Forces training facility known as Kearns Army Air Base (also known as Kearns Center; redesignated: Camp Kearns, 1 January 1944). Construction of the base involved building airplane runways and hangars, with several taxiways and a large parking apron and a control tower. Several hundred buildings were also constructed and quickly assembled. Most base buildings, not meant for long-term use, were constructed of temporary or semi-permanent materials. Most support buildings sat on concrete foundations but were of frame construction clad in little more than plywood and tarpaper. The thousands of soldiers and airmen stationed there temporarily made the base one of the largest cities in the state. On 15 August 1946 the Air Force inactivated the base, and turned the facility over to the State of Utah. The presence of roads and other infrastructure made the area attractive to developers. Houses and business sprang up rapidly on what had just a few years earlier been farmland. Today only two buildings remain of the former Air Base. The airfield part of Kearns Army Air Base today is known as South Valley Regional Airport. Since Kearns came into existence, it has been known as a township. However in the years of 2010-2015 a movement began and Kearns officially became a Metro Township. In 2016 the first election was held for the Metro Township to elect the first council members. There were 5 elections for each of the 5 districts in the Kearns Metro Towniship. In 2017 the first council members of the Metro Township Were sworn into office. According to the United States Census Bureau, the CDP has a total area of 4.8 square miles (12 km2), all of it land. This climatic region is typified by large seasonal temperature differences, with warm to hot (and often humid) summers and cold (sometimes severely cold) winters. According to the Köppen Climate Classification system, Kearns has a humid continental climate, abbreviated "Dfb" on climate maps. According to estimates from the Kem C. Gardner Policy Institute of the University of Utah, as of 2015, there were 36,530 people in Kearns. The racial makeup of the county was 60.21% non-Hispanic White, 0.89% Black, 0.79% Native American, 2.07% Asian, 1.95% Pacific Islander, and 2.41% from two or more races. 31.68% of the population were Hispanic or Latino of any race. As of the census of 2010, there were 35,731 people, 9,789 households, and 9,209 families residing in the CDP. The population density was 7,444 people per square mile (4,625.5/km²). There were 10,169 housing units at an average density of 2,118.5/sq mi (1,316.4/km²). The racial makeup of the CDP was 70.29% White, 1.39% African American, 1.44% Native American, 2.08% Asian, 2.64% Pacific Islander, 18.72% from other races, and 3.45% from two or more races. Hispanic or Latino of any race were 32.83% of the population. There were 9,789 households out of which 54.1% had children under the age of 18 living with them, 67.3% were married couples living together, 13.1% had a female householder with no husband present, and 13.8% were non-families. 10.5% of all households were made up of individuals and 3.7% had someone living alone who was 65 years of age or older. The average household size was 3.65 and the average family size was 3.88. In the CDP, the population was spread out with 37.2% under the age of 18, 11.2% from 18 to 24, 32.0% from 25 to 44, 13.4% from 45 to 64, and 6.3% who were 65 years of age or older. The median age was 26 years. For every 100 females, there were 102.5 males. For every 100 females age 18 and over, there were 100.2 males. The median income for a household in the CDP was $45,711, and the median income for a family was $46,598. Males had a median income of $31,444 versus $22,838 for females. The per capita income for the CDP was $14,110. About 5.1% of families and 7.1% of the population were below the poverty line, including 9.3% of those under age 18 and 6.5% of those age 65 or over. ^ "CENSUS OF POPULATION AND HOUSING (1790–2000)". U.S. Census Bureau. Retrieved 31 July 2010. Wikimedia Commons has media related to Kearns, Utah. This page was last edited on 15 August 2018, at 20:04 (UTC).